ULISSE COMPACT is a robust and efficient PTZ camera unit designed to ensure dynamic, non-stop surveillance of large outdoor areas and withstand harsh weather conditions, reducing maintenance to zero. Optimal operation is ensured in very hot environments up to 60°C or in very cold environments up to -40°, thanks to optional enhanced heating. The accurate top-mount configuration guarantees long-range vision and continuous horizontal axis rotation, combining high speed with absolute tracking accuracy, both in manual mode and in patrol mode. The integrated camera ensures superior image quality, even in poorly lit environments. To ensure detailed images even during the night hours, versions are available with LED illuminators, with infrared light or white light. The ULISSE COMPACT PTZ camera can be equipped with a wiper for removing rain and dust from the front glass; there is a wide selection of jerry cans with washer pump, different capacities and heads. 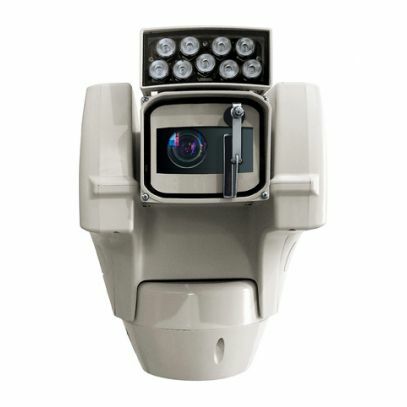 The IP-based PTZ camera versions can be integrated into a network system, with network control of all PTZ functions. The Videotec's PTZ ASSISTANT plug-in software supports any VMS with the control of all special functions such as wiper, washer pump and IR. H.264/AVC compression allows high definition images to be transmitted via Ethernet with optimisation of bandwidth and video storage space. The compliance with ONVIF Profile S provides an open architecture for maximum integration with IP systems of industry major brands.